It is designed for use with the Nikon FX, full-frame, cameras such as the D3x so you gain the full benefit of the 28mm focal length. Attached to a DX format Nikon camera, the 1.5x sensor magnification gives an equivalent focal length of 42mm making the field-of-view more similar to a standard focal length lens rather than a wide-angle. At a suggested retail price of $699.95 (USD), this lens falls firmly into the mid-range price bracket, but with two aspherical elements in its lens design and a circular 7-blade aperture diaphragm optical quality should be high and the bokeh should be smooth. Additionally, Nikon’s Nano Crystal Coat lens coating has been used to reduce ghosting and flare and their well regarded Silent Wave Motor (SWM) AF system is fitted to give great autofocus functionality. In the overall DxOMark lens ratings, the AF-S Nikkor 28mm f/1.8G scores 29. This puts it into seventh place on the list, just one point behind the Samyang 35mm f/1.4 AS UMC Nikon lens. For a wide-angle lens, this is a remarkable result. Mounted on a Nikon D3x, the Nikkor AF-S 28mm f/1.8G scores a remarkable 29 in DxOMark and shows a P-Mpix resolution of 19, with distortion and vignetting scores that are well controlled for a wide-angle lens. Compared to other wide-angle prime lenses, as you’d expect, its score of 29 takes it to the top of the list as the best performing wide-angle lens we’ve tested, near behind the Carl Zeiss Distagon T 35mm f/1.4 ZF2 Nikon into fourth place by 4 points. Overall it offers the best price to performance ratio available for any prime wide-angle lens on the Nikon FX mount. Looking at sharpness for all prime lenses tested on the Nikon D3x in relation to the lens’ selling price shows just how well the Nikkor AF-S 28mm f/1.8G performs. Its mid-range price, but high end performance marks it out as a lens offering very good value for money. If we look at the DxOMark scores, normalized by testing on a Nikon D3x, we find the AF-S 28mm f/1.8G lens puts in a strong performance, coming 4th on the overall list of lenses and second out of all the wide-angles tested on that camera. In fact, of all the Nikon FX mount lenses tested on any Nikon camera, the Nikkor AF-S 28mm f/1.8G occupies the top on the list – mounted on D3X. It’s equal Nikon AF-S Nikkor 24mm f/1.4G ED and Nikon AF-S NIKKOR 35mm f/1.4G on this same body. Looking at all lenses tested on the Nikon D3x, the score of 29 shows that only two wide-angle lenses have scored similarly or better, Nikon’s own Nikkor 24mm f/1.4G with a price of $2200 USD and the Zeiss 35mm f/1.4 priced at $1843 USD. So where is this lens strongest? Clearly, the resolution score of 19P-Mpix makes it one of the best prime wide-angle lens tested on the site. Traditionally wide-angle lenses will score lower than telephoto lenses because of the requirements of the optical design. For this lens to score so well shows that the lens engineers have one their homework, producing a stellar lens that outperforms so many other high quality optics – even their own Nikkor AF-S 35mm f/1.4G that scored 15P-Mpix. Wide-angle lenses also suffer from distortion, but again it is very well controlled here, showing only 0.5% distortion (0.2% corresponds to noticeable distortion). It makes the lens very well suited to architecture where minimal distortion is a benefit in avoiding curved lines out towards the edge of the frame. The negative points of the lens are few and far between. In fact, the biggest fault is the lens shading present when shooting at full aperture (f/1.8) where the corners can lose up to -1.7EV compared to the centre. This corner shading is also present up to around f/2.8 but from there on, it has mostly disappeared. However, to put this into context, it is a wide-angle lens and lens shading is to be expected. -1.7EV may sound a lot, but for a wide-angle it is perfectly acceptable and even ranking wide-angle lenses based on their lens shading scores, this lens stays at the top of the list. The inclusion of the Nikon Silent Wave Motor Autofocus is another plus for the lens. It will ensure fast, quiet autofocus to match the optical performance of the lens. Comparing these three lenses shows the range of results when attached to a Nikon D3x. In the Nikon lens line-up, the two Nikkor lenses compared here offer very similar specifications with the exception of the maximum aperture. Comparing them side-by-side shows where the extra expense is justified in going for the Nikkor 28mm f/1.8G. Looking at the overall DxOMark scores on the D3x, the Nikkor 28mm f/1.8G is at the top with 29 while the Nikkor 28mm f/2.8D only manages 23. The Zeiss lens fits in the middle, scoring 25. In terms of sharpness the 28mm f/1.8G manage 19P-Mpix and is at the top end of the table for wide-angle primes. The 28mm f/2.8D, with a score of 14P-Mpix is down at the lower range of the table (-however given the lower price point and simpler optical construction this is to be expected). The Zeiss with 16P-Mpix fits in the middle. The distortion scores between the three lenses are very similar – sufficiently so that there would be no obvious difference in final image prints. In the lens shading, or vignetting, results however, there is an interesting switch between the Nikkor 28mm f/2.8D and the Zeiss, with the lower priced Nikkor scoring -1.8EV to the Zeiss’ -2EV. Both though are beaten by the Nikkor AF-S 28mm f/1.8G scoring -1.7EV and hence offering the most even light transmission across the image frame. Looking at the Chromatic Aberration scores, again the familiar order is restored, with the 28mm f/1.8G scoring 10µm to the Zeiss’ 12µm and the 28mm f/2.8D’s 17µm. With these scores, all three will show some level of Chromatic Aberration, but it will be least intrusive on the Nikkor 28mm f/1.8G images. For CA measurements, a score of 5 is determined to be noticeable and corresponds to around 1pixel of CA around high contrast edges on most cameras, so with the 28mm f/1.8G you can expect up to 2pixels of CA around high contrast edges. Overall, the Nikkor 28mm f/1.8G provides the best results of these three in all lens performance tests. 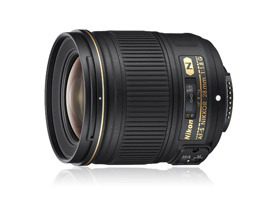 The Nikon AF-S Nikkor 28mm f/1.8G is a highly competitive lens. It is very well priced for the quality it offers and for a prime wide-angle lens the optical performance is, quite simply, staggering. Whatever genre of photography you enjoy, from landscapes to travel, reportage or architecture, the 28mm f/1.8G will ensure you capture the scene as accurately as possible. If you’re looking for an FX-fit wide-angle lens to mount on your Nikon FX camera, the 28mm f/1.8G represents not just the ‘best’ choice in terms of optical performance, but also the ‘smart’ choice because the performance per pound/dollar/euro ratio is so high. It is going to take a quite special lens from the third party manufacturers like Sigma, Tamron and Zeiss to knock the Nikkor from its perch as the king of Nikon FX format wide-angle prime lenses.